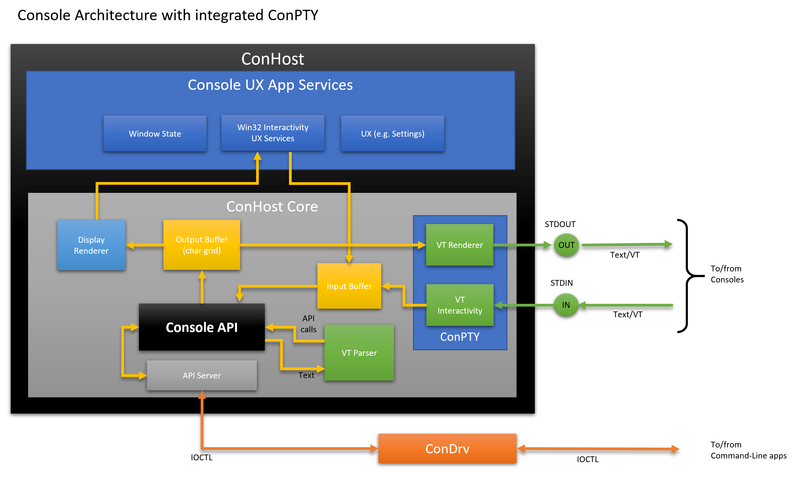 In this, the fourth post in the Windows Command-Line series, we’ll discuss the new Windows Pseudo Console (ConPTY) infrastructure and API – why we built it, what it’s for, how it works, how to use it, and more. In the previous post in this series, we started to explore the internals of the Windows Console and Windows’ Command-Line infrastructure. We also discussed many of Console’s strengths and outlined its key weaknesses. 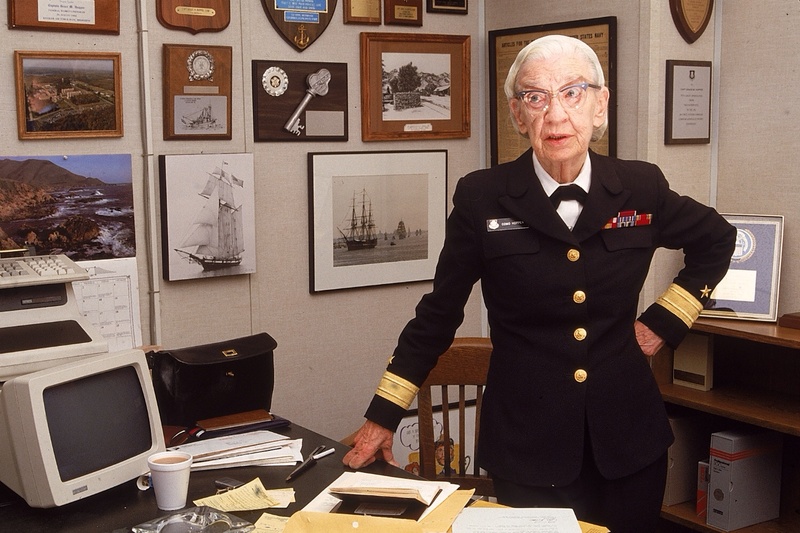 As discussed in the first ‘backgrounder’ post in this series, in the early days of computing, users operated computers via electromechanical Teletype (TTY) devices connected to a computer via some form of serial communications link (typically a 20mA current loop). 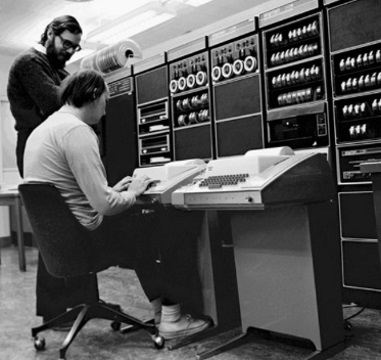 Despite their simplicity (or perhaps because of it), Terminals rapidly became the primary devices used to operate mini, mainframe, and server computers: Most data entry clerks, computer operators, system administrators, scientists, researchers, software developers, and industry luminaries earned their digital-stripes by pounding away on Terminals from DEC, IBM, Wyse, and many others. Starting in the mid 1980’s, dedicated Terminal devices gradually started to be replaced by general purpose computers that were rapidly becoming more affordable, popular, and powerful. Many early PCs and other computers of the ’80s had Terminal applications that could open a connection to the PC’s RS-232 serial port and exchange data with whatever was listening on the other end of the connection. As general-purpose computers grew in sophistication, the Graphical User Interface (GUI) arrived and introduced a whole new world of simultaneously running applications, including Terminal applications. But a problem arose: How would a Terminal application speak to another Command-Line application running on the same machine? And how would you attach a physical serial cable between the two apps running on the same computer? In the *NIX world, this problem was solved by the introduction of the Pseudo Terminal (PTY). The PTY virtualizes a computer’s serial communications hardware, exposing “master” and “slave” pseudo-devices: Terminal apps connect to a master pseudo-device; Command-Line applications (e.g. 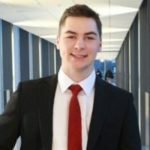 shells like Cmd, PowerShell, and bash) connect to a slave pseudo-device. When the Terminal client sends text and/or control commands (encoded as text) to the master, the text is relayed along to the associated “slave”. Text emitted by the application is sent to the slave and is then routed back to the master and thus to the Terminal. Data is always sent/received asynchronously. Importantly, the “slave” pseudo-device emulates the behavior of a physical Terminal device and converts command characters into POSIX signals. For example, if a user types CTRL+C into the Terminal, the ASCII value of CTRL+C (0x03) is sent via the master. When received by the slave, the 0x03 value is removed from the input stream and a SIGINT signal is generated. This PTY infrastructure is used extensively by *NIX Terminal applications, text pane managers (like screen, tmux), etc. Such apps call openpty() which returns a pair of file descriptors (fd) for the PTY’s master and slave. The app can then fork/exec the child Command-Line application (e.g. bash), which uses its slave fds to listen and return text to the attached Terminal. This mechanism allows Terminal applications to “talk” directly to Command-Line applications running locally in the same way as the Terminal would talk with a remote Computer via a serial/network connection. What, no Windows Pseudo Console? Windows obstructs 3rd party Consoles and Server Apps: Windows (currently) does not provide Terminals a way to supply the communication pipes via which it wants to communicate with a Command-Line app. 3rd party Terminals are forced to create an off-screen Console, and to send it user-input and scrape its output, redrawing the output on the 3rd party Console’s own display! We’ve heard from many, many developers, who’ve frequently requested a PTY-like mechanism in Windows – especially those who created and/or work on ConEmu/Cmder, Console2/ConsoleZ, Hyper, VSCode, Visual Studio, WSL, Docker, and OpenSSH. Since taking ownership of the Console ~4 years ago, the Console Team has been busy overhauling the Windows Console & Command-Line internals. While doing so, we regularly and carefully considered the issues described above and many other related asks and issues. But the internals weren’t in the right shape to make a Pseudo Console feasible … until now! Windows’ new Pseudo Console (ConPTY) infrastructure, API, and several other supporting changes will remedy/facilitate an entire class of issues … without breaking or damaging backward compatibility for existing command-line applications! The new Win32 ConPTY API (formal docs to follow soon) is now available in recent Windows 10 Insider builds and corresponding Windows 10 Insider Preview SDK, and will ship in the next major release of Windows 10 (due sometime in fall/winter 2018). 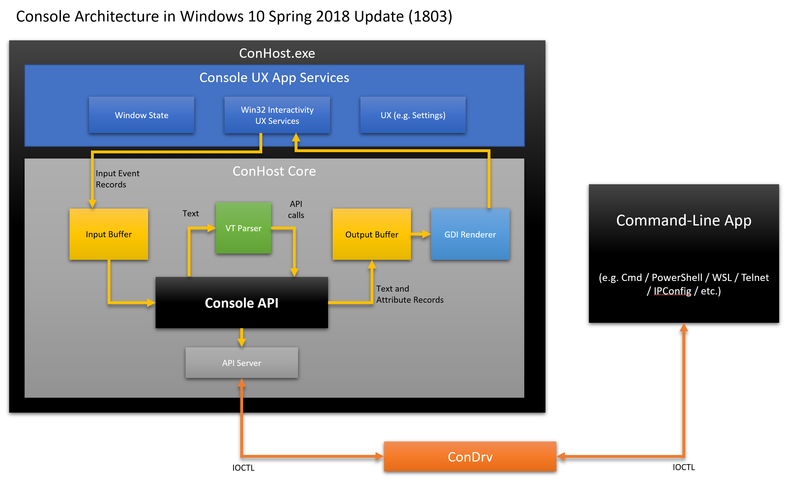 To understand ConPTY, we have to revisit the architecture of Windows Console … or more accurately … ConHost! It’s important to understand that while ConHost implements what you see and know as the Windows Console application itself, ConHost also contains and implements most of Windows’ Command-Line infrastructure! From now on, however, ConHost also becomes a true “Console Host”, supporting all Command-Line applications and/or GUI applications that communicate with Command-Line applications! Okay, but what does this actually mean? How Do Windows Command-Line Applications Work? To better understand the impact of the new ConPTY infrastructure, let’s consider for a moment how Windows Console and Command-Line applications have worked up until now. Whenever a user launches a Command-Line application like Cmd, PowerShell, or ssh, Windows creates a new Win32 process into which it loads the app’s executable binary file, and any dependencies (resources or libraries). The newly created process usually inherits the stdin and stdout handles from its parent. If the parent was a Windows GUI process, there are no stdin and stdout handles and so Windows will spin up and attach the new app to a new Console instance. Communications between Command-Line apps and their Console are transported via ConDrv. For example, if launched from a non-elevated PowerShell instance, the new app process will inherit its parent’s stdin/stdout handles and will therefore receive input from and emit output to the same Console as the parent. There is a little “hand-waving” going on here as there are cases where Command-Line apps are launched attached to a new Console instance, especially for security reasons, but the cases described above are generally true. Whenever a Command-Line application is executed, Windows will connect the app to a new or existing ConHost instance. The app and its Console instance are connected via the kernel-mode Console Driver (ConDrv) which sends/receives IOCTL messages containing serialized API call requests and/or text data. When a Command-Line app calls Windows Console APIs, the API calls are serialized into IOCTL messages and sent via the ConDrv driver. ConDrv then delivers the IOCTL messages to the attached Console, which decodes and executes the requested API call. Return/output values are serialized back into an IOCTL message and sent back to the app via ConDrv. Microsoft tries, wherever possible, to maintain backward compatibility with existing apps/tools. This is especially true in the Command-Line world. In fact, 32-bit editions of Windows 10 can still run many/most “Win16” 16-bit Windows apps and executables! Runs as usual, reading input and calling Console APIs without any knowledge that its ConPTY ConHost is translating its input/output from/to UTF-8 encoded text/VT! The latter point is important! When a legacy Command-Line app uses a Console API like WriteConsoleOutput(...), the specified text is written to the attached ConHost’s Output Buffer. Periodically, ConHost renders changed areas of the Output Buffer as text/VT which is sent via stdout back to the Console. Ultimately, this means that even traditional Command-Line apps “speak text/VT” externally, without requiring any changes! Using the new ConPTY infrastructure, 3rd party Consoles can now communicate directly with modern and traditional Command-Line applications, and speak text/VT with all of them. To run Command-Line applications remotely (i.e. on remote machines, servers, or in containers), there is a challenge: Command-Line apps running on remote machines communicate with a local ConHost instance because IOCTL messages are not designed for use over a network connection. So how does input from a Console running on your client machine get to the remote machine, and how does output from the app running on the remote machine get back to your client Console? Further, what if you’re running a Linux or Mac machine that has Terminals, but not Windows-compatible Consoles, and don’t understand how Windows Console works? So, to remotely operate a Windows machine we need a communications broker of some kind – one that can transparently serialize data across some form of network connection and manage app instance lifetime, etc. Thankfully, OpenSSH was recently ported to Windows and added as a Windows 10 optional feature. PowerShell Core has also adopted ssh as one of its supported PowerShell Core Remoting protocols. And for those who’ve invested in Windows PowerShell, Windows PowerShell Remoting is still a viable option. Calls Console APIs to emit/style text, move the cursor, etc. Fun, right? No, it’s not! There’s a lot that can and does go wrong, especially in the process of simulating and sending user-input and scraping the output buffer to/from the off-screen Console. This results in instability, crashes, data corruption, excessive power consumption, etc. Further, not all apps do the work to scrape text properties as well as text itself, which results in text formatting being lost, and remoted applications’ text being “monochromatized”! The ConPTY-enabled approach above is clearly much cleaner and simpler for the sshd service. The only Windows Console API calls are being executed entirely within a Command-Line app’s ConHost instance which converts any visible changes into text/VT: Nothing ConHost is connected to need know that the app its hosting calls Console APIs rather than generating text/VT itself! We think you’ll agree that this new ConPTY remoting mechanism results in an elegant, consistent, simpler architecture. Combined with the powerful features built into ConHost, supporting legacy apps, and rendering changes caused by apps calling Console APIs into text/VT, the new ConHost and ConPTY infrastructure helps us carry the past into the future. The ConPTY API is available in the current Windows 10 Insider Preview SDK. // Creates a "Pseudo Console" (ConPTY). // Resizes the given ConPTY to the specified size, in characters. // to the ConPTY will also terminated. Below is a small code example of how to call the ConPTY API to create a Pseudo Console and attach a Command-Line application to the created ConPTY. Note: A simple sample illustrating how to use the Pseudo Console API is available here. // Note: Most error checking removed for brevity. // Prepare the StartupInfoEx structure attached to the ConPTY. // input an up arrow (to get the previous command), and enter again to execute. // Suppose some other async callback triggered us to resize. // This call will update the Terminal with the size we received. Note: Closing the ConPTY will terminate the associated ConHost and any attached clients. The introduction of the ConPTY API is perhaps one of the most fundamental, and liberating, changes that’s happened to the Windows Command-Line in several years … if not decades! We, the Console team, have already ported some of Microsoft’s tools to use the ConPTY API. We’re also working with several teams inside Microsoft (Windows Subsystem for Linux (WSL), Windows Containers, VSCode, Visual Studio, etc. ), and with several external parties including @ConEmuMaximus5 – creator of the awesome ConEmu 3rd party Console for Windows. But if you’d like to, you can also introduce new VT support gradually or in new feature areas if you wish – the decision is yours. 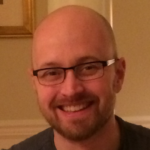 If you’re a developer working on a stand-alone Console/Terminal app, or are integrating a Console inside of an application, then we strongly encourage you to explore and adopt the new ConPTY API at your earliest convenience: Adopting the ConPTY API (rather than the older off-screen Console mechanism) is likely to eliminate several classes of bugs, while increasing stability, reliability, and performance. As an example, the VSCode team currently maintains an issue (GitHub #45693) that tracks several issues caused by Windows’ current lack of a Pseudo Console. The new ConPTY API will be available for the first time in the Autumn/Fall 2018 release of Windows 10. If you need to support earlier versions of Windows, then you’ll likely need to test at runtime whether the currently running version of Windows supports ConPTY. As with most Win32 API’s an effective way to test if an API is present is to use Runtime Dynamic Linking approach of calling LoadLibrary() & GetProcAddress(). If the currently running version of Windows supports ConPTY, your app can find and call the new ConPTY APIs. If not, you’ll have to revert to the convoluted mechanisms used until now, as outlined above. There’s a lot to unpack from the information above, but we feel it is important to understand why we make changes and improvements such as introducing a Pseudo Console API, as well as what we built. Our goals here are to eradicate an entire class of issues and limitations for developers of Console and server apps, and to make developing code for the Windows Command Line infrastructure more powerful, consistent, and fun. We look forward to hearing from you via Feedback Hub. For more complex problems, please file issues on our Windows Console GitHub Repo. And if you have questions, please ping me on Twitter. We can’t wait to hear about what you build atop the new Pseudo Console API.